Southeast Chicago used to be one of the largest steel-producing regions in the world. Beginning in the late 19th century, the steel mills along Lake Michigan employed hundreds of thousands of people: immigrants from every region of the world; workers of all ethnicities; people searching for a better life. But that all began to change in the 1980’s. One by one, the mills closed, leaving a region devastated by a crumbling economy and a toxic environment left behind by heavy industry. A forgotten region. Even the exit ramp here is numbered Zero. Interweaving home movies, found footage, and a first person narrative, the film traces the stories of multiple generations of producer Christine Walley’s family in the once-thriving steel mill community of Southeast Chicago. From the turn-of-the-century experience of immigrants who worked in Chicago’s mammoth industries to the labor struggles of the 1930s to the seemingly unfathomable closure of the steel mills in the 1980s and 90s, these family stories convey a history that serves as a microcosm of the broader national experience of deindustrialization and its economic and environmental aftermath. Chris Boebel is an alumnus of New York University’s Graduate Film Program in the Tisch School of the Arts and recipient of both a Paramount Pictures Grant and a teaching fellowship. Currently, he is the manager of MIT Video’s post-production unit and a producer of documentary and other video programs at MIT Video Productions, part of the MIT Libraries. Chris is also instructor and co-developer of MIT’s “DV Lab”, a graduate and undergraduate course that combines theoretical analysis of science documentaries with hands-on documentary production. He has produced and directed two feature films, Red Betsy and Containment: Life After Three Mile Island, as well as a number of short films and television programs. Chris’s work has screened at more than 50 film festivals around the world, including the Sundance Film Festival, and has appeared on many television networks, including PBS, the BBC, and Nickelodeon. 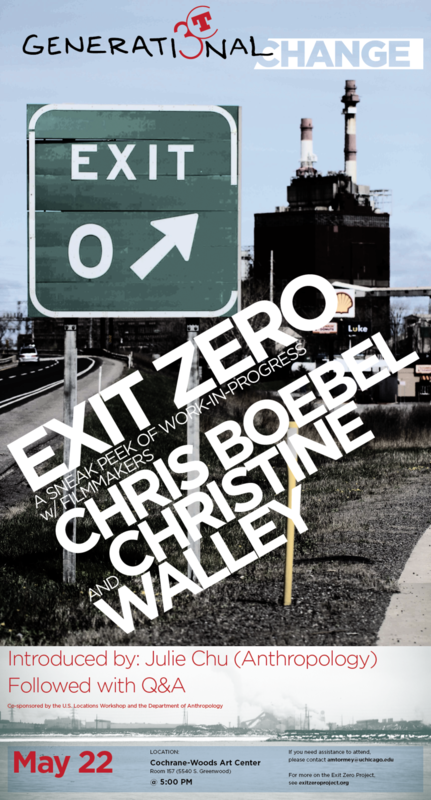 Currently, he is collaborating with his wife, Christine Walley, on a new documentary video project entitled, Exit Zero, a first-person account of the long-term impact of deindustrialization in Southeast Chicago. Christine Walley is an Associate Professor of Anthropology at MIT. She received her Ph.D. in anthropology from New York University in 1999. Her first book Rough Waters: Nature and Development in an East African Marine Park (Princeton University Press, 2004) was based on field research exploring environmental conflict in rural Tanzania. Her current project Exit Zero uses family stories to examine the long-term impact of deindustrialization in the United States. It includes a forthcoming book with University of Chicago Press (2013) as well as a documentary film made with director Chris Boebel. Chris Walley and Chris Boebel are also the co-creators and co-instructors of the documentary film production and theory class DV Lab: Documenting Science Through Video and New Media. This sneak-peek is co-sponsored by the Department of Anthropology (Lichtstern Fund), the U.S. Locations Workshop (CAS) and the Anthropology of Infrastructure Working Group Fund.